Hi, Toni Holmes here. Last month I offered up a gluten-free blueberry cake. I couldn't help but make another wonderful blueberry dessert. The fresh fruits of summer make the best pies. 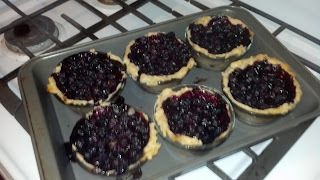 I created the pictured mini gluten-free blueberry pies. They are perfect for individual desserts. I made these in Corning glass cups with plastic tops for freezing. All gluten-free food tastes best when warm. So I freeze all but what I'm eating that day. Then pop them into the microwave for 20-40 seconds for fresh warm desserts. Hint: if you place a cup of water in your microwave baked goods will stay moist. These pies are blueberry, but can easily be adapted to peach, apple and berry pies. When working with pie crust-the key is to use cold butter, cold water and, if you can, mix with cold utensils. Another hint is to use vinegar -this pie crust mix does just that. Finally- the less you handle pie crust the lighter and flakier it will be. 1/2 teaspoon of finely shredded lemon peel. Mix the sugar and cornstarch and peel with the blueberries. Set aside. Make dough as directed. But before I refrigerated my crust dough, I made six balls of dough. Then after the hour of cooling the recipe calls for, I took the dough out one ball at a time. I rolled each between two pieces of wax paper. Gluten free dough tends to be stickier than regular flour. I always roll out between sheets of wax paper. I peel off one sheet of paper, then place the dough side into the cup. Peel the second sheet off and finish sticking down any edges. Repeat for all six cups. Place cups on a cookie sheet or I used a 13x9x2 in pan to catch any juice that spills over. My mom often said that you know a pie is done when the juice over flows. Fill the cups with the berry mixture. 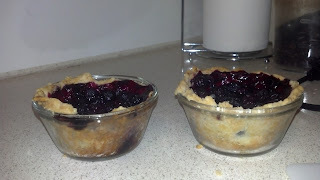 Bake in a preheated 350 degrees F oven - since I used glass cups, I adjusted my temperature to 325 degrees F. bake for 40 minutes or until berry juice bubbles up and crusts are a golden brown. Remove from oven and let cool. Can be frozen or served warm. I added a dollop of vanilla ice cream to mine. Gluten-free of course! I love blueberry season! I gobble them all before I have time to cook with them, or even freeze them. Yum! Wow this sounds delicious! Thanks Nancy. I want to try this recipe but I'm worried about microwaving the frozen dish. Won't it break?